The genus Cordyline includes 15 species of woody to semi-woody monocotyledonous flowering plants found in the western South Pacific north to India. The genus, until recently, has been placed in the Lily (Liliaceae) or Agave (Agavaceae) families but currently, and depending on the author, it is listed in the Asteliaceae, Liliaceae, Laxmaniaceae, Lomandraceae or Dracaenaceae. We currently list Cordyline with the visually similar Dracaena in the Dracaenaceae. There are several more tropical species such as the Ti plant, Cordyline fruticosa, that are grown indoors or in frost free locations but the plants that most California gardeners are familiar with are the more hardy New Zealand species. The most common of these is the tree statured Cabbage Tree (also sometimes called Grass Palm, Green Dracaena, or by it's Maori name Ti Kouka), Cordyline australis and its many colorful selections. More recently cultivars of other species, including Cordyline pumilio, Cordyline kaspar and Cordyline banksii and interspecific hybrids between these and Cordyline australis have made their way in the horticultural trade in California. Some of these newer plants are smaller clump forming plants, which makes them considerably more useful in the landscape. San Marcos Growers has been growing Cordyline australis since the nurseries inception in 1979. Over the years we have added new cultivars to our product listing and planted many of them in our gardens. The nursery's demonstration garden has some specimens that are 20 years old or more and likely are among the largest of a particular cultivar that might be found in California. In general all of the cultivars of Cordyline australis and the hybrids will grow well in full coastal sun to light shade and prefer good drainage. They are fairy drought tolerant but grow more lush with regular irrigation and all seem to tolerate conditions near the ocean with some protection from the salt laden winds (Seaside Zone 2 - See our Seaside Plant Information. While hardiness data has not been established on the newer cultivars they are likely hardy to about the same temperatures as Cordyline australis which is generally considered hardy to around 15° F and maybe a bit less. People that grow these plants in colder climates than us, note that they can be planted in warmer USDA Zone 8 locations and even warm Zone 7 if given protection. Below is a listing of the Cordyline plants we have grown in the past or are currently growing. Cordyline australis - This is the plant seen as a small yucca or palm-like tree all over New Zealand with a single basal trunk with many branches reaching up 30 ft. The branches are tipped with narrow semi-stiff but not rigid leathery medium green colored sword-like leaves that 2 to 3 ft long by 1 to 2 inches wide. Flowers in late-spring into summer are panicles of tiny cream-white fragrant flowers. This plant is a common sight in California gardens and was in fact growing in Santa Barbara when Dr. Francesco Franceschi (Fenzi) did his ornamental plant survey in 1895. It has long been mistakenly identified as Cordyline indivisia, which is a broader leaved Cordyline (sometimes called the Blue Dracaena) that is much rarer in California. We have a large specimen plant of Cordyline australis along our nursery frontage on Hollister Avenue. We grew it from 1979 until 1995 but are currently not growing this plant. Cordyline australis 'Atropurpureum' (aka ''Atropurpurea' and 'Purpurea') - This long time nursery plant is the bronze or red leafed form of Cordyline australis and has been grown in California since at least 1902 when it was listed as cultivated in Baily's Cyclopaedia of American Horticulture (where it is listed as Cordyline australis var. atropurpurea, Hort). While there may have been some legitimate cultivars selected that used this name for the most part these plants were seed grown and there is considerable variability in crops of this plant. Likely many of the more modern named red leafed cultivars were selected from these seedlings. We have an elegant old specimen of one of these seedlings in our nursery garden and grew crops of Cordyline australis 'Atropurpurea' from seed from 1988 until 1994 but are currently not growing this plant. Cordyline australis 'Albertii' - A striking variegated form of Cordyline australis that forms dense clusters of arching, sword-like leaves at the end of the stems that are dark green with a pink midrib and creamy yellow edges. Leaves age to green with creamy yellow stripes. This plant can grows as large as the species as evidenced by a specimen well over 25 feet tall that we have in our garden. This plant produces white flowers in the late spring. This plant reportedly was developed a selection from seedling grown plants in Belgium in the 1800's and later named for the King Albert I, the monarch of Belgium from 1909 to 1934 . It was obtained by the Hillier's Nursery, of Winchester, England in 1918 and then brought back to New Zealand in the 1930's. A plant was given to Victor Davies of Duncan and Davies Nursery of Plymouth, New Zealand. It was slowly propagated at the nursery and released for sale in 1979 using the name 'Sir Victor Davies'. This plant may have also been called Cordyline australis aurea-striata. San Marcos Growers first received plants of Cordyline australis 'Albertii' from Duncan and Davies in 1991 and offered it in our catalog from 1992 until 1997 at which point we could no longer source the plant from New Zealand though it is very similar, if not the same, as the plant currently available under the name 'Torbay Dazzler'. Cordyline australis 'Dark Star' This Cordyline australis cultivar has very dark reddish bronze leaves and may be able to grow as large as the species though it is not a vigorous plant. It appears to be a mutation of 'Red Star' and was received by San Marcos Growers in 2005 from a tissue culture lab mixed with plants of 'Red Star'. It is like 'Red Star' but has darker foliage but from our experience does not grow as well. We grew it from 2007 until 2009 but are currently not growing this plant. Cordyline australis 'Jive' - A showy tree type Cordyline that grows to 7 to 8 feet tall up on a single trunk with leaves that are at first have bands of cream on bright emerald green and then mature to brilliant yellow set against a deep forest green. We have not seen this cultivar bloom yet but it likely will have the tiny pale lilac flowers, with a jasmine-like fragrance, and held above the foliage on branched stems that other Cordyline have. Plant in full sun to part shade in a well drained soil with regular to occasional irrigation. We have not had it outside for a cold winter but likely this plant will tolerate temperatures down to 20° F. A great plant for a mass planting or as featured as a specimen potted plant. This plant was bred in Te Awamutu and is part of The Dancing Series with varieties 'Can Can', 'Cha Cha’, 'Polka', 'Salsa' and 'Jive' from Peter Fraser of Growing Spectrum Nursery in Waikato, New Zealand. We have grown this plant since 2012. Cordyline australis 'Krakatoa' PPAF This is a really interesting cultivar that is beautiful and at the same time perplexing. It was a very showy plant with tufts of 3 feet long dark pink striped with red brown leaves with a broad band of pink fading to an off white with age. This plant lives up to its name with new reddish growth looking like newly emerging lava that then turns nearly white. While it can be one of the showiest of the Cordyline its vareigation seems very unstable and the plants often fade to a bronze red color though new foliage is often still bright. It is also very prone to sun burning of the foliage while in its pale white phase. 'Krakatoa' was originally introduced by Hewton Nurseries of Devon England. It was a sport of 'Torbay Red' (a palnt similar if not the same as 'Dark Star') that occurred in tissue culture but they too thought the plant very unstable. San Marcos Growers acquired this plant in 2005 but has since discontinued growing it. Cordyline australis 'Pink Champagne' This new cultivar of Cordyline australis has narrow upright pale green leaves that are variegated along their margins with cream white and blushed with pink near the base. This plant is similar to 'Torbay Dazzler' and 'Albertii' but with narrower leaves and because of its slow growth is not supposed to grow as large - time will tell! Best in full coastal sun to light shade - some shade protection necessary in hotter inland gardens. It is drought tolerant in coastal gardens but responds well to occasional to regular irrigation. Useful in dry gardens but also offers a tropical look. A great container plant. It can tolerate coastal conditions if protected from direct sea winds (Zone 2). It is hardy to around 15° F, growing well in USDA zones 9-10 (and possibly warmer Zone 8 locations). In the RHS Cordyline Trials James Armitage wrote of this plant that it was a sport that occurred during the process of micropropagation. We began growing this plant in 2008. Cordyline australis 'Paradise' A very interesting and exotic pale colored plant with leaves that are pale coral to salmon colored with bronze margins. We are not sure that this plant is a selection of Cordyline australis selection as we have listed it, or if it is a hybrid since there has been little information published about it. Like other Cordyline australis it seems to have the single rosette of broader leaves but we have noted that some nurseries growing this plant list is only as Cordyline 'Paradise', which would imply that it was a hybrid and not a selection of Cordyline australis. If this plant is a Cordyline australis selection we speculate that it will grow much the same as the other selections and eventually become reach 20-25 feet but likely much slower as it lacks much in the way of chlorophyll. We grew it from 2008 until 2012 but are currently not growing this plant. Cordyline australis 'Pink Passion' [Seipin] PP19,927 - This cultivar is a very showy plant with arching, sword-like leaves that are dark gray-purple with bright pink margins midrib that form a crown the ends of the branches. This is a vegetative sport of 'Red Star' and so likely will eventually get as tall as it (we have a 20 foot specimen of ''Red Star' in our nursery garden) and likely will produce the same large panicles of small, sweet-scented flowers in late spring. This plant was introduced by Seiont Nurseries in Wales, UK and we began growing it in 2015. Cordyline australis 'Pink Stripe' - This cultivar is a showy and vigorous plant with dense clusters of arching, sword-like leaves that are dark gray-green with a pink midrib that forms a crown the ends of the branches. We have an 8 foot specimen in our nursery garden and it has produced large panicles of small, sweet-scented flowers in late spring. Though we are not sure of the origins of this plant the first time we noticed it was in a retail nursery in New Zealand in 1994 under the name 'Kiwi Dazzler'. We did not find a source that could ship us the plants until 1998 so first offered this plant in 1999 and grew it until 2011 when other more colorful cultivars replaced it.WE currently are not growing this plant. Cordyline australis 'Red Sensation' - This cultivar has long broad leaves colored purplish red. Compared to 'Red Star' this cultivar is more vigorous with slightly wider leaves that are more purple (less red) and has more green venation (especially prominent on older leaves). We grew this cultivar when we were not able to get stock of 'Red Star' but discontinued growing it in 2003 after securing ample stock of Cordyline 'Red Star', which we consider a far superior plant. Some report that this plant is the same as 'Red Star' but we grew the two side by side and they are definitely different plants. We grew this plant from 2000 until 2009 but are currently not growing this plant. Cordyline australis 'Red Star' - This vigorous cultivar has very dark reddish bronze sword-like leaves. Some report that this plant is the same as ''Red Sensation' but we grew the two side by side and they are definitely different plants. Compared to 'Red Sensation' it has slightly narrower leaves that are more rusty red (less purple) color and have a more prominent green edge. We feel this to be the best of the reddish bronze selections of Cordyline australis. It is a vigorous plant and we have several large specimens (one nearly 20 feet tall) in the nursery garden. We originally received this plant in 1993 from Twyford Plant Laboratories and have continued to grow it ever since. A plant later introduced by Torbay Palm Farm from near Cornwall, England called 'Torbay Red' was reportedly a sport of 'Red Star' but James Armitage, who conducted a Cordyline study for the Royal Horticultural Society notes that there were no discernable differences between this plant and 'Red Star' and the two should be synonymized under the older name. Cordyline australis 'Southern Splendour' - This new cultivar is a very showy plant with clusters of arching, sword-like leaves that are dark gray-green with bright pink margins. We received this plant in 2007 from Foremostco of Miami, Florida with the British English spelling of 'Southern Splendour' but also note that some US nurseries have altered the cultivar name to use the Americanized spelling of 'Southern Splendor'. We grew this plant from 2008 until 2011 but are currently not growing this plant. Cordyline australis 'Sundance' This cultivar has deep green sword-like leaves that have a thin midrib stripe of pink and a pink leaf base. We originally received this plant in 1993 from Twyford Laboratories and have continued to grow it ever since. There has been some speculation that this plant is the same as Cordyline australis var veitchii, a plant described as early as 1902 in, L.H. Baily's 1902 edition of "Cyclopedia of American Horticulture". The description from this book of a plant having the "base of leaf and underside of midrib bright crimson" is very similar to that of 'Sundance'. We grew this plant from 1993 until 2009 but are currently not growing this plant though we still have a large mature specimen in the garden. Cordyline australis 'Sunrise' PP20,634 - This Cordyline australis cultivar has very showy with leaves that have a dark reddish pink mid stripe and bright pink margins. Although this plant is likely to grow slower it could grow to the same proportions as the species becoming a branched 10 to 20 foot tall by 5 to 10 foot wide evergreen tree and producing large panicles of small, sweet-scented white flowers in late spring to summer. It is a bit like the hybrid 'Electric Pink' but as a Cordyline australis cultivar is likely to be more upright and single stemmed unless cut back to encourage branching. This plant, selected for its strong, very bright pink stripe on the leaf and for its compact internodes is a product of a breeding program conducted by Arthur George Rendle of New Plymouth, New Zealand in 1996. It is the result of crossing Cordyline australis 'Torbay Dazzler' as the pollen parent with Cordyline australis 'Purple Tower', the seed parent. We began growing this plant in 2009. Cordyline australis 'Torbay Dazzler' Cordyline australis 'Torbay Dazzler' - Cordyline 'Torbay Dazzler' is a showy focal plant with an upright habit to 25 ft. tall. It is a palm-like, sub-tropical tree that grows erect until with some age it will fork to produce more heads. The green strap leaves have a strong cream variegation along the leaf margin. This plant came from Torbay Palm Farm from near Cornwall, England and was a Royal Horticultural Society Award of Garden Merit winner in 2004. San Marcos Growers first received its plants in 2003 and we continue to grow this great cultivar though it looks to be fairly similar and may be the same as Cordyline australis 'Albertii', which we grew from 1992 until 1997. Cordyline 'Cardinal' A smaller clump forming Cordyline that forms a rosette to 3 feet tall with glossy arching red leaves that first emerge narrow and widen with maturity. Plant in full sun (along coast) to shade and water regularly. Plant in full sun to part shade in a well drained soil with regular to occasional irrigation. The best foliage color will likely be in full to partial coastal sun to morning sun to shade inland. We have not had it outside for a cold winter but likely it will have a similar hardiness as other Cordyline hybrids and tolerate down to 20 F. A nice plant for containers or the front of a planting where the attractive red arching foliage can be emphasized. This plant, introduced by Ball Ornamentals, is thought to be an interspecific hybrid involving Cordyline australis and C. banksii, though it seems more solitary without the basal suckering habit seen in other hybrids involving C. banksii such as 'Renegade', 'Jurred' and 'Electric Pink' though has the arching, narrower and shinier leaf with a cupped clasping petiole that is typical of this hybrid cross. Hopefully it will also have the small fragrant pale purple flowers that the others hybrid Cordyline display in summer months. This plant is very similar if not the same as plants being sold as 'Crimson Star'. We grew this plant from 2009 until 2012 but are currently not growing this plant. Cordyline 'Cha Cha' - A colorful clumping variety of Cordyline that grows to 3 to 4 feet tall with weeping, variegated foliage in a blend of colors that starts out apricot and peach and matures to a mix of yellow and green with all colors present at the same time. We have not seen this cultivar bloom yet but it likely will have the tiny pale lilac flowers, with a jasmine-like fragrance, and held above the foliage on branched stems that other Cordyline have. Plant in full sun to part shade in a well drained soil with regular to occasional irrigation. We have not had it outside for a cold winter but likely this plant will tolerate temperatures down to 20° F. A great plant for a mass planting or as featured as a specimen potted plant. This plant is part of a series called The Dancing Series with varieties 'Can Can', 'Cha Cha’, 'Polka', 'Salsa' and 'Jive'. They are the result of breeding performed by Peter Fraser of Growing Spectrum Nursery in Waikato, New Zealand. We first offered this plant in 2012. Cordyline 'Design-a-line Burgundy' - A strikingly beautiful tight clump forming Cordyline 3 feet tall by equal width with fine textured burgundy colored weeping foliage. As with Cordyline 'Jurred' this plant is a hybrid of the larger Grass Tree (Cordyline australis) and the smaller Cordyline banksii - early reports from New Zealand indicate that 'Design-a-line Burgundy' is faster growing and is more rigid in the pot. We have not seen this plant flower yet but suspect it will have a similar flower to other Cordyline hybrids with this parentage which means summer tiny pale lilac flowers, with a jasmine-like fragrance that are held above the foliage on branched stems. Selected by Lyndale Nursery of New Zealand. We first started growing this pant in 2010. Cordyline Electric Flash ['Sprilecflash'] PPAF - A very interestingly colored Cordyline with narrow leaves that have a chocolate colored central stripe and cream colored margins. As with the other "Electric" series it is a cultivar of Cordyline banksii. Though listed as only growing to 4 feet, we suspect it will be like the others in the series and approach about twice this with new shoots rising from the base and along the stems. Plant in a well-drained soil. While fairly drought tolerant in coastal gardens, it will certainly be more lush with regular irrigation and should prove hardy to around 15° F, growing well in USDA zones 9-10. This Cordyline banksii hybrid comes from Sprint Horticulture of Wamberal, New South Wales, Australia. We first started growing this plant in 2014. Cordyline Electric Pink ['Sprilecpink'] PP19,213 - An outrageously bright pink colored plant with an upright habit of many narrow dark maroon leaves that are edged with bright pink - truly electric! This cultivar is a bit of a mystery - its growth habit appears similar in appearance to other brightly colored Cordyline australis cultivars, though it seems to be more clump forming with a developing caudex. We have heard speculation that it is a cultivar of Cordyline banksii, the Forest Cabbage Tree or Ti Ngahere that clumps more like a Phormium. Some also think it a hybrid between Cordyline australis and Cordyline banksii. This parentage could make this plant a smaller more clumping species rather than having tree-like stature of the Cordyline australis cultivars, which easily reach 25 ft. tall. We will update this page as we observe this new plant and get more information. This plant was part of the Bodger Botanicals product line sold exclusively by Henry F. Michell Company. San Marcos Growers first started growing this plant in 2007. 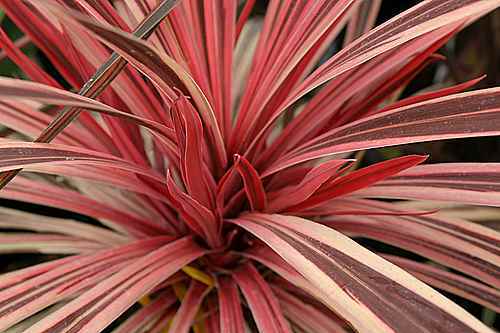 Cordyline Electric Star ['Sprilecstar'] - An interestingly colored plant with an clumping upright habit with many narrow leaves that appear mostly green but have a deep burgundy central stripe - very unusual! Like its sister Cordyline 'Electric Pink', this cultivar is a bit of a mystery - its growth habit appears similar in appearance to other brightly colored Cordyline australis cultivars, though it seems to be more clump forming with a developing caudex. It is listed as a cultivar of Cordyline banksii, the Forest Cabbage Tree or Ti Ngahere that clumps more like a Phormiumand his parentage could make this plant a smaller more clumping species rather than having tree-like stature of the Cordyline australis cultivars, which easily reach 25 ft. tall. Though usually listed as a plant only growing to 4 feet we have found reports of it exceeding 6 feet in Australia and if related to 'Electric Pink', then even taller is not out of the question - the tallest plants we have measured of 'Electric Pink' are about 7 feet tall with considerable basal branching so the taller stems could be cut out to maintain a lower clumping plant. As with other Cordyline it will be best with a well drained soil and will likely by fairy drought tolerant in coastal garden but more lush with regular irrigation and should prove hardy to around 15° F, growing well in USDA zones 9-10. This plant from Sprint Horticulture of Wamberal, New South Wales is protected overseas under the Plant Breeders Rights (PBR) program and has a plant patent applied (PPAF) in the US. San Marcos Growers first started growing this plant in 2012. Cordyline Festival Grass™ ['Jurred'] PP14224 - This small Cordyline has vivid burgundy red leaves atop a slowly developing 2 to 3 foot tall by 1 1/2 inch wide stem. The 1/2 to 3/4 inch wide leaves are 2-3 feet long and emerge upright but become somewhat lax with age, arching over so the tips reach the ground. In summer appear the tiny pale lilac flowers, with a jasmine-like fragrance, held above the foliage on branched stems. Plant in full sun (along coast) to deep shade and water regularly. Plants in shade are a darker more purple color while sun grown plants have more red. Cordyline 'Jurred' was developed by Felix M. Jury and Mark C. Jury, in Taranaki, New Zealand. It is of hybrid origin with the seed parent thought to be a hybrid itself between Cordyline banksii and Cordyline australis 'Purple Tower' and the pollen parent being Cordyline pumilo. It was originally released in New Zealand in 1996 as Cordyline 'Red Fountain' but received US Plant Patent 14,224 in October 2003 using the name Cordyline 'Jurred' and is marketed in the US as Festival Grass, a trademarked name owned by Anthony Tesselaar Plants Pty Ltd. San Marcos Growers began growing this plant in 2005 - our plants were grown on from plants purchased from Monrovia Nursery. We grew it from 2005 until 2009 but are currently not growing this plant. Cordyline fruticosa 'Soledad Purple' Soledad Purple Ti Plant) - An upright compact plant to 6 to 8+ feet tall with deep, glossy green, leaves that are 18 inches long by 1 to 2 inches wide leaves that clasp the stem like a sheath. The new growth is paler and flushed with purple. The small light violet flowers occur winter into and spring from amongst the axils of the upper leaves and are followed by black berries. Plant in part coastal sun or light shade and give regular irrigation. Hardy to 25 F. Seems less bothered by the snails and slugs that disfigure other Ti cultivars in our California gardens. This plant is sometimes sold as a Cordyline stricta cultivar but really appears to a hybrid involving Ti, Cordyline fruticosa. We grew this plant from 2010 until 2012 but are currently not growing this plant. Cordyline Purple Dazzler Black Cordyline A beautiful and unusual plant that suckers at the base to produce multiple narrow stems that rise vertically up to 3 feet or more with a crown of narrow dark purple-black shiny leaves that almost look plastic. This plant looks a lot like a Ti plant (Cordyline fruticosa) but acts a bit more like the hardier Cordyline stricta. Plant in full coastal sun to light shade. Water occasionally to regularly. Protect from temperatures below 28 F. We first saw this plant labeled as Cordyline 'Dark Purple' at a retail nursery in December 2006 and thought it an attractive Ti Plant but then noticed it was growing it in full sun and had gone unprotected through the previous winter. Though cut to the ground at 25 degrees F it resprouted and has been growing well ever since. This maybe a cultivar our hybrid of Cordyline fruticosa but that it is hardier and does not suffer from the snails that often disfigure this species. This plant may be the same as C. fruticosa 'Black Ribbon Whatever you call this plant, it is a great addition for Southern California gardens where it happily grows in full sun (coastal)to light shade and produces among the darkest leaves of any plant. We have grown this plant since 2011. Cordyline Renegade ['Tana'] PP18,605 - A new and distinct tight clump forming Cordyline that grows up from swollen underground stem to 2 feet tall with arching dark purple to nearly black foliage that has a glossy lacquered finish. This plant is most notable for its dramatic foliage but also has small fragrant pale purple flowers on delicate stems in summer months as an added bonus. Plant in full sun to part shade in a well drained soil with regular to occasional irrigation. The best foliage color has been observed by the breeder in New Zealand to be in full morning sun with afternoon shade. We have not had it outside for a cold winter but it is listed as hardy to USDA Zones 8-11. It is a very distinctive plant and while somewhat similar to Cordyline 'Jured', it has darker purple black foliage where 'Jured' is more of a cherry red. 'Tana' is also observed to be tighter and less wobbly at the base. This plant resulted from a presumed cross between Cordyline australis and Cordyline banksii that was selected by David Lloyd at his Plantlife nursery in Ashhurst, New Zealand. In 1999, Mr. Lloyd sowed seed he had purchased as Cordyline australis purpurea and noted that some of the resulting seedlings were clump forming with drooping foliage, more typical of the smaller Forest Cabbage Tree, Cordyline banksii. He selected one of these plants with particularly dark glossy foliage and named it 'Tana'. San Marcos Growers began trialing Cordyline 'Tana' in 2007 and the plant received US Plant Patent 18,605 on March 18, 2008. It is being marketed in the US by PlantHaven under the trade name Renegade. We have grown this plant since 2009. Cordyline australis cuprea or 'Cuprea' - Described as "dark-leaved form with the slender leaves entirely a coppery reddish brown." ("Exotica 3: Pictorial Cyclopedia of Exotic Plants from Tropical and Near-Tropical Regions", Roehrs Company Inc, 1976) In "Tropica: Color Cyclopedia of Exotic Plants and Treen", A. Graf Roehrs Co 1981 this plant as 'Cuprea' listed as a synonym for 'Atropurpurea'.